Who hasn’t at some time made a daisy chain from the common lawn daisy and worn it as a circlet or crown. Bellis Perennis as it is officially named, is another fabulous healer spreading itself at our feet. As we tread on this unassuming little plant it bounces back unaffected. A trauma remedy par excellence, here is it’s signature. 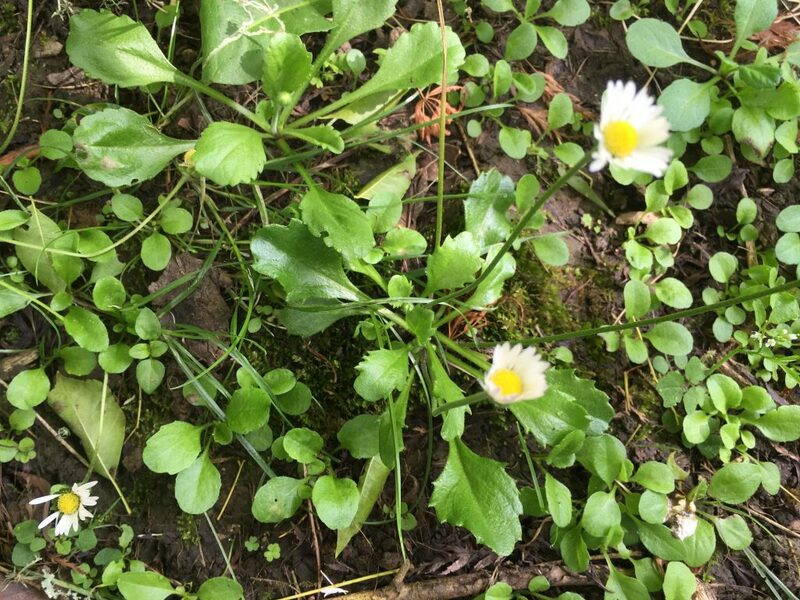 The Daisy works on the muscular fibres of the blood vessels and venous congestion. It’s similar to arnica. Less exotic and more available. Overlooked and underused, in my opinion. A homeopathic gem in pregnancy and post-partum, when bruising and trauma is extreme. There has not been much medical interest in this wee daisy, although it’s use by herbalists has been recorded since the 16th century. Common Names; Lawn daisy, Common daisy, English daisy, Bruisewort, Meadow daisy, Daisy. Description; Bellis perennis is an herbaceous perennial growing to 8 inches high to 8 inches wide. Each plant forms clusters with short creeping rhizomes. The spoon-shaped leaves arranged in flat, neat rosettes are 1-2 inches long, evergreen and hairy. The small daisy flowers are produced on long leafless stems and open at dawn. Each flower has a bright yellow centre, surrounded by petal-like, tightly packed clusters of florets. The petals are white with the underside often showing flushes of red to pink. The plant produces flowers nearly all year round, from spring through to autumn. Preparations; creams/balms, homeopathic remedies, tinctures/extracts, poultices, decoctions, pills/capsules. Habitat; Bellis Perennis has naturalised throughout the temperate region of the world. It is native to western, central and northern Europe and western Asia. It thrives on grasslands, lawns and meadows preferring well-drained and alkaline soils in sun or partial shade. Traditional & Historical uses; Gerard mentions the Daisy in his 16th century Herbal under the name of Bruisewort recommending it as an unfailing remedy for coughs and catarrh, bronchitis, pains and aches, bruises and swellings, wounds, boils, fevers, inflammatory joints, heavy menstruation, migraine, inflammation of the liver and all the inward parts. An old recommendation for gout by Culpepper and Gerard is ascribed to it’s ability to cleanse the blood. Chewing the fresh leaves was used to accelerate the healing of mouth ulcers. Homeopaths prescribe for pelvic floor bruising/trauma before and after childbirth, soreness of the abdominal walls during pregnancy and after trauma or surgery to the torso. Therapeutic Actions; Antimicrobial, antioxidant, analgesic, anti-inflammatory, antispasmodic, antitussive, expectorant, demulcent, emollient, astringent, digestive, laxative, purgative, dysmennorrheal, tonic, opthalmic. Constituents; saponins, polyacetylenes, tannins, flavonoides, resin, mucilage, bitters, essential oils. Current Herbal uses; Externally; bruises, swellings, traumatic injuries to breast and pelvic area, haematoma, varicose veins, as an insect repellent,? Internally; chewing fresh leaves for mouth ulcers, a blood tonic, blood purifier, heavy menstruation, catarrh, rhinitis, rheumatism, mild laxative, liver and kidney disorders. Gardening Applications; Although considered a weed in a well-manicured lawn by many, it can be a welcome addition in a more informal setting. Providing food for bees and other insects I for one welcome it in my rather unruly lawn. Naturally by Trisha products containing bellis perennis; Aches and Pains, Pile it On.